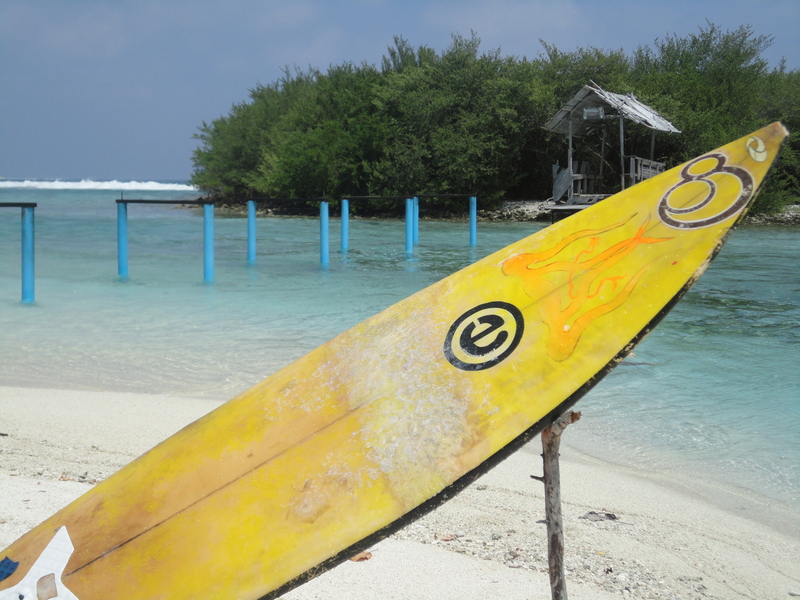 A local inhabited island that makes Coca Cola in the North Male atoll is fast becoming a haven for backpackers in search of surf, sea, sun and sand and a little splash of culture too. 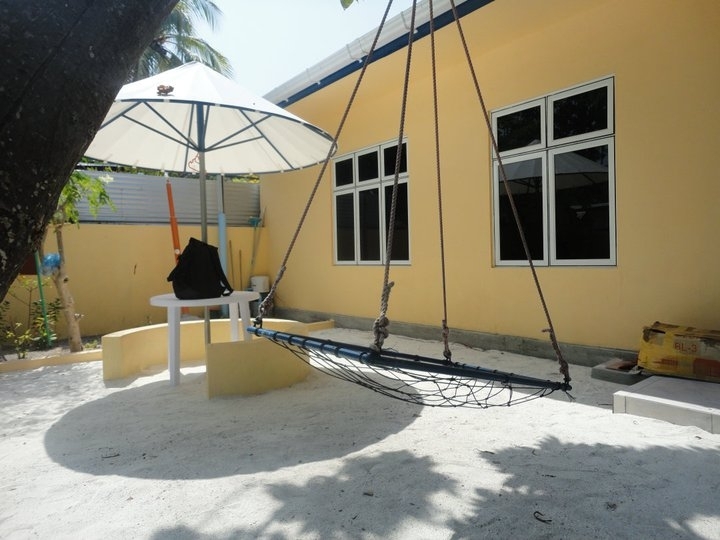 As well as being an inhabited island where thousands of people work and live, Thulusdhoo is also known as ‘Coke’s Surf Camp’. 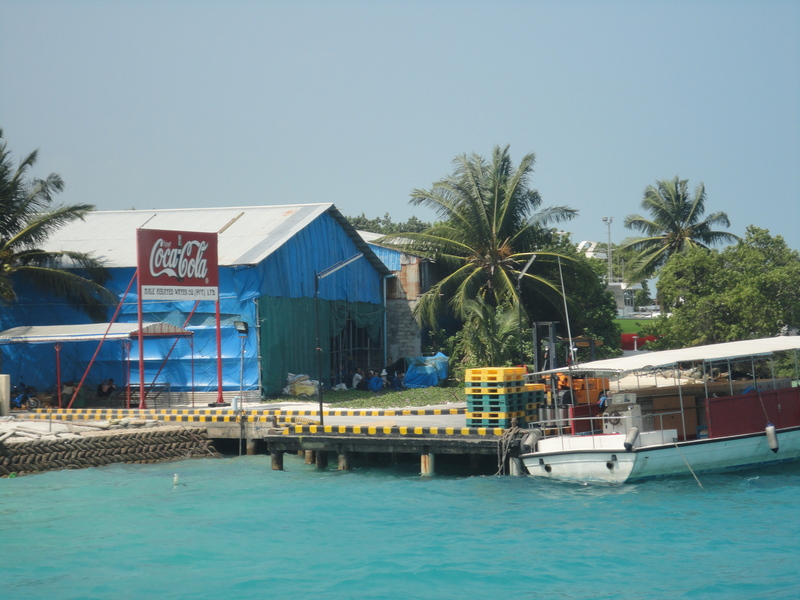 Don’t be fooled by the prefix to this nickname, there is nothing packaged about Coke’s-Thulusdhoo. Just two hours dhoni ride from Male, or 45 minutes by speedboat, this charming island offers a different experience to laid-back resort life. It gives backpackers the chance to live as the locals do. To boot you can get to grips with one of the best surf breaks in the country – ‘Cokes’ which too is named after the fizzy drink factory. The first port of call for weary travellers is a new guest house specifically aimed at European backpackers called Surfers World. The camp itself features a five bedroom hostel with comfortable and clean beds which sleeps between two and four people per room. It has all the modern creature comforts of home, perfect to relax your muscles in time for the next day’s ride on the waves. In fact there’s no need to leave the camp with an entertainment room complete with a wide-screen TV featuring over 400 channels and free wifi. There is a large private outdoors chill area too and because it is closed it is possible to bask in a bikini so as not to offend the locals. Local life awaits those willing to venture outside the cosy surroundings; just don’t forget to cover up! Inhabitants of Thulusdhoo follow a traditional way of life, yet equally islanders embrace independent travellers. Culture is abundant in these islands, you can visit the many cafes to sample ‘short eats’ and engage with the lively local community about politics or just simply walk around to take in the beauty of the island. Curious visitors can even tour the coke factory to see how it is all made on request. Did you know that this island is the only place in the world to make Coke with desalinated water! Of course the main appeal of this island is its surf and surf scene. In fact the island’s crowning glory is its famous surf point ‘Cokes’, but there is in fact another nearby break called Chickens, named after a nearby island which breeds, well, chickens. Both are natural breaks which crash over coral formations. Of course this makes for a niche market of extreme surfing that pulls in champions from all over the world. However, for those less keen to join the vibrant surf scene, there’s still plenty to do. Bask with baby reef sharks and tropical fish in the nearby lagoon. Once you tire of snorkelling why not rest up on the white sandy beach just a short wade across the lagoon. If you’re feeling energetic, push through the jungle foliage to discover surf relics left by founding fathers of the sport. A personal fave is a bench made out of two surfboards that overlooks the mighty surf. By night this same spot becomes a mecca for local barbecuers, offering a unique chance for tourists to mix with locals in relaxed settings – so we discovered after a hard day’s snorkelling and sunbathing. Traditionally Maldivian men fish for their food. So, in the late afternoon we ladies lounged on the swaying undolis in the garden of the guest house as the men went in search of our supper. Despite their best attempts to catch a giant squid earlier that afternoon, the boys came back with three large reef fish, caught fresh from the lagoon (their catch included a small relative of the hump back snapper known locally as a ginimas), an emperor fish -known in Divehi as “filolhu” and a job fish or “giulhu”, (Sea Bass). With this vital piece of protein, plus a bit of rice, roshi and chilli spice, we set off down the quiet sandy streets by torchlight with only the torch to guide us through jungle outcrop to our barbeque point, pausing briefly to chop down a palm branch for firewood. 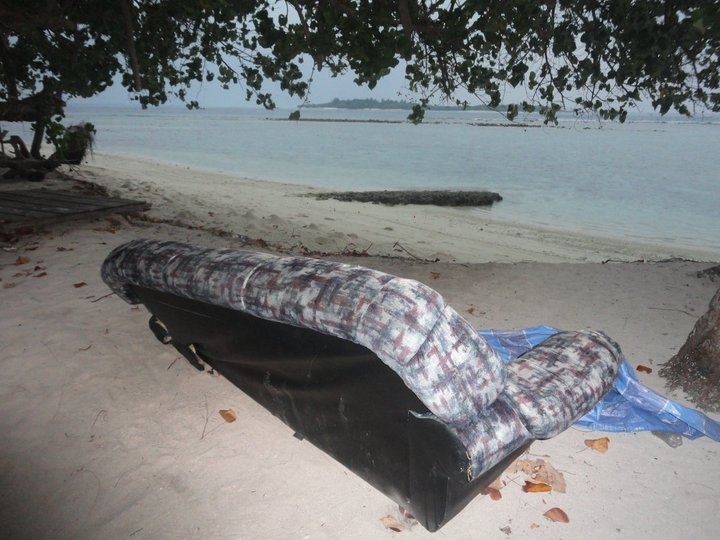 Settling on a secluded part of the beach under a starry night sky with only the sound of our animated voices and the roar of the tide and surf, we discovered a beat-up old couch – just like in the tv series ‘Friends’ – overlooking the sea. It turned out we weren’t the only ones who liked this spot. If National Geographic is your bag, then throw away the TV amd remote and sit on his couch watching the sun go down over the bay. It is an experience that no money can buy. On a clear night, thousands of stars glitter like diamonds and the warm inviting lagoon glows with luminescent plankton. 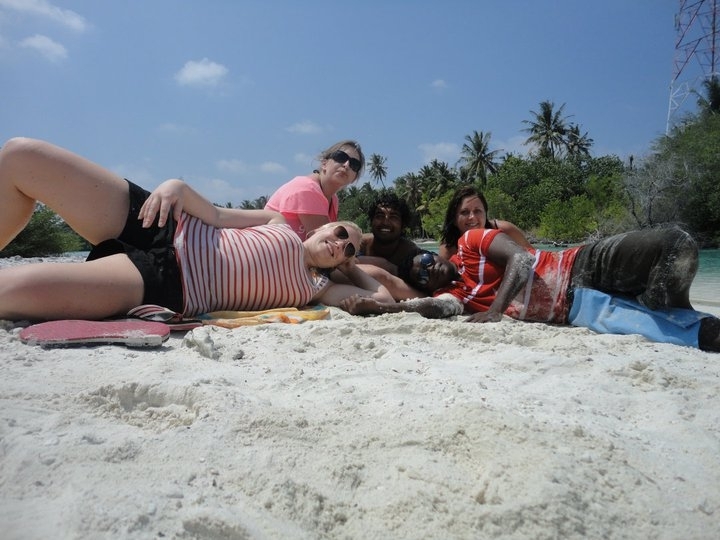 Our group gathered around a wooden crate specifically left on the beach for barbecue gatherings such as these. Now a Maldivian barbeque is an art form in itself. Hanging the fish up on a tree away from inquisitive cats who skulked around the area, our guides began digging a hole in the ground and then boxed the cooking area with bricks. 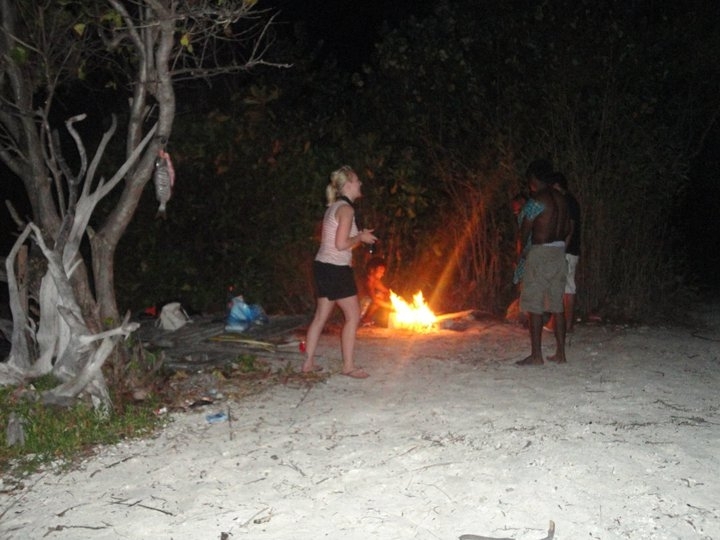 Maldivians use coconut shells to fuel their fires rather than charcoal. For one it is cheaper, secondly its consistency makes it naturally good fuel and thirdly the shells give off a sweet smell as they burn to embers. “Before the birth of tourism, civil servants were each given a coconut tree to make their living from,” so our guide Mohamed Shivaz tells us. “Each bit of the tree had its use and one major use is to build and fuel a fire”. All the elements from the tree are used to light the fire, from the branch which is shaved into a stoker, to the leaves and branches which are the kindlewood. Naturally the coconuts shells rest below along with bits of bark to complete the puzzle. With the ground still dewy from the sporadic tropical downpour earlier, at first lighting the fire was tricky, but thanks to the persistence of the experienced local guides it wasn’t long before flames leapt into the air and danced a merry dance. But our seasoned guides soon took them down proving they were in fact stone cold. 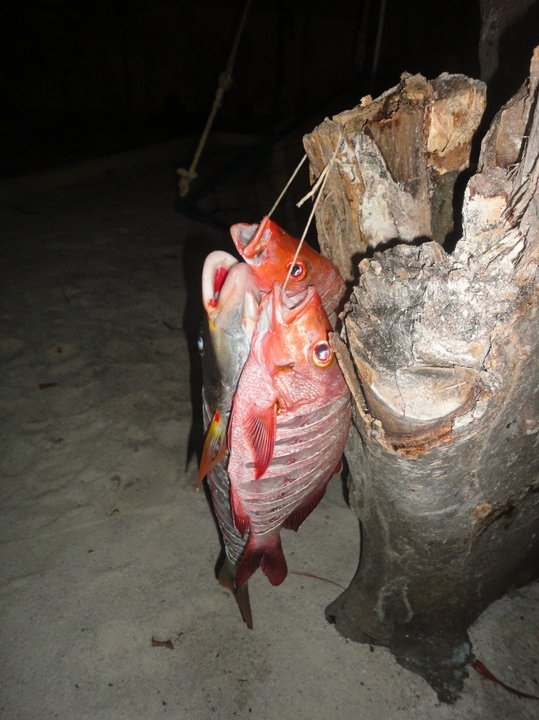 They then began filleting and marinating each fish, skewering them with rolled-up coconut leaves. I watched as they lathered one side in traditional style and lightly pepper the other side with our tame European taste buds in mind. Once the embers burned maroon red it was time to place the fish on the fire and it didn’t take long for the fish cook. A sweet aroma of spice tickled our nostrils, luring us back to shore after chasing plankton in the lagoon. As the boys turned the fish over slowly, we girls laid the table with the side dishes and condiments. Additional supplies such as roshi, rice, water and drinks were ferried back and forth from the village by helpers on mopeds. We couldn’t wait to tuck into our feast. It was worth the wait. The tender, moist fish melted in our mouths and our delicious fayre was washed down with locally made Coca Cola, manufactured just a few metres away – as of course this is a local island, alcohol is hara’am. It wasn’t a bother because our party was already in a merry mood chatting and swopping stories. Once we had eaten our fill another treat was in store as we cleared our palettes with a local aperitif known as “Kilhi.” This was made up of crushed sweet Maldivian nuts mixed with sugar and beetle leaves. 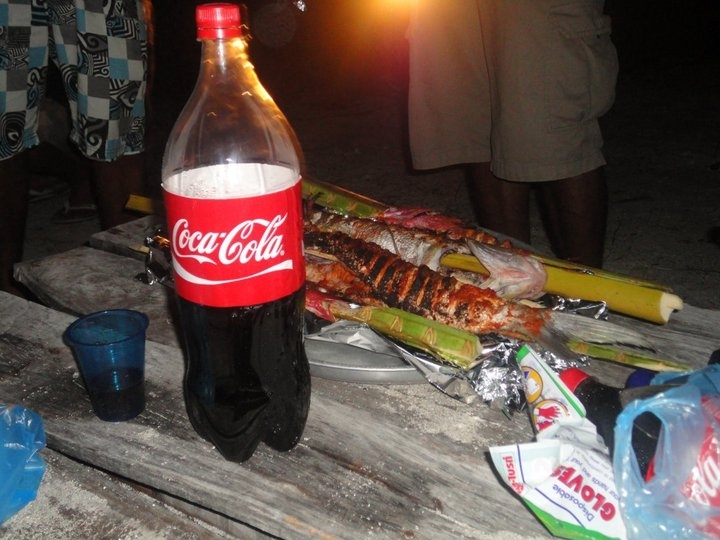 With fish from the lagoon and Coca Cola from the factory, our group proved that you don’t need to import food here in the Maldives-save rice and roshi. Theoretically you can survive purely on the materials available on the island. Overall, I can truly say that this was the closest to a true castaway experience in theMaldives, with a nice cosy bed too. I can’t wait to do it again. Awesome stuff, Donna. Keep it up! Yes living in Male’ you live side by side with locals and enjoy the city life. However, if you really want to get to know the locals why not opt to live in Hulhumale’ or Vilingili in Male’ atoll, even Addu Atoll. There are many local islands where foreigners have never set foot. You have to visit them.